Presidential election results map. Blue denotes those won by Johnson/Humphrey, red denotes states won by Goldwater/Miller. Numbers indicate the number of electoral votes allotted to each state. The United States presidential election of 1964 was the 45th quadrennial presidential election. It was held on Tuesday, November 3, 1964. Democratic candidate and incumbent President Lyndon B. Johnson had come to office less than a year earlier following the assassination of his predecessor John F. Kennedy. Johnson, who had successfully associated himself with Kennedy's popularity, won 61.1% of the popular vote, the highest win by a candidate since James Monroe's re-election in 1820. It was the most lopsided US presidential election in terms of popular votes, and the sixth-most lopsided presidential election in the history of the United States in terms of electoral votes. No candidate for president since has equalled or surpassed Johnson's percentage of the popular vote, and since 1820, only Abraham Lincoln in 1864, Franklin D. Roosevelt in 1936, Richard Nixon in 1972 and Ronald Reagan in 1980 and 1984 have won by a greater electoral vote margin. Goldwater's unsuccessful bid influenced the modern conservative movement and the long-time realignment within the Republican Party, which culminated in the 1980 presidential victory of Ronald Reagan. His campaign received considerable support from former Democratic strongholds in the Deep South and was the first Republican campaign to win Georgia in a presidential election. Conversely, Johnson won Alaska for the Democrats for the first (and only) time, as well as Maine (for the first time since 1912) and Vermont (for the first time since the Democratic Party was founded). Since 1992, Vermont and Maine have rested solidly in the Democratic column for presidential elections, and Georgia has remained in the Republican presidential fold since 1996. No post-1964 Democratic presidential candidate has been able to match or better Johnson's performance in the electoral college (the only Republicans to do so since have been Nixon in 1972 and Ronald Reagan in 1980 and 1984), or Johnson's performance in the Mountain and Midwestern regions of the United States. While on the first campaign swing of his re-election effort, President Kennedy was assassinated on November 22, 1963 in Dallas, Texas. Supporters were shocked and saddened by the loss of the charismatic President, while opposition candidates were put in the awkward position of running against the policies of a slain political figure. During the following period of mourning, Republican leaders called for a political moratorium, so as not to appear disrespectful. As such, little politicking was done by the candidates of either major party until January 1964, when the primary season officially began. 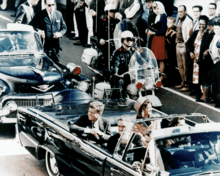 At the time, most political pundits saw Kennedy's assassination as a way of leaving the nation politically unsettled. The nomination of Johnson was assured, but he wanted to control the convention and to avoid a public fight over civil rights. Nonetheless, Johnson faced challenges from two sides over civil rights issues over the course of the nomination season. The segregationist Governor of Alabama, George Wallace, ran in a number of northern primaries against Johnson, and did surprisingly well in primaries in Maryland, Indiana, and Wisconsin against favorite son candidates who were stalking horses for Johnson. All favorite sons, however, won their primaries. In California, Yorty lost to Brown. 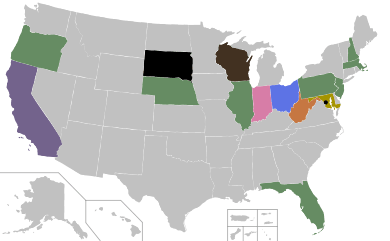 Democratic primary results by state. At the national convention the integrated Mississippi Freedom Democratic Party (MFDP) claimed the seats for delegates for Mississippi, not on the grounds of the Party rules, but because the official Mississippi delegation had been elected by a white primary system. The national party's liberal leaders supported an even division of the seats between the two Mississippi delegations; Johnson was concerned that, while the regular Democrats of Mississippi would probably vote for Goldwater anyway, rejecting them would lose him the South. Eventually, Hubert Humphrey, Walter Reuther and the black civil rights leaders including Roy Wilkins, Martin Luther King Jr., and Bayard Rustin worked out a compromise: the MFDP took two seats; the regular Mississippi delegation was required to pledge to support the party ticket; and no future Democratic convention would accept a delegation chosen by a discriminatory poll. Joseph L. Rauh Jr., the MFDP's lawyer, initially refused this deal, but they eventually took their seats. Many white delegates from Mississippi and Alabama refused to sign any pledge, and left the convention; and many young civil rights workers were offended by any compromise. Johnson lost Louisiana, Alabama, Mississippi, Georgia and South Carolina. 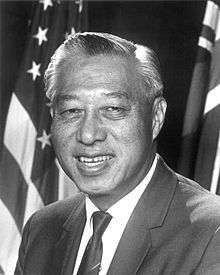 Johnson also faced trouble from Robert F. Kennedy, President Kennedy's younger brother and the U.S. Attorney General. Kennedy and Johnson's relationship was troubled from the time Robert Kennedy was a Senate staffer. Then-Majority Leader Johnson surmised that Kennedy's hostility was the direct result of the fact that Johnson frequently recounted a story that embarrassed Kennedy's father, Joseph P. Kennedy, the ambassador to the United Kingdom. According to his recounting, Johnson and President Franklin D. Roosevelt misled the ambassador, upon a return visit to the United States, to believe that Roosevelt wished to meet in Washington for friendly purposes; in fact Roosevelt planned to—and did—fire the ambassador, due to the ambassador's well publicized views. The Johnson–Kennedy hostility was rendered mutual in the 1960 primaries and the 1960 Democratic National Convention, when Robert Kennedy had tried to prevent Johnson from becoming his brother's running mate, a move that deeply embittered both men. In early 1964, despite his personal animosity for the president, Kennedy had tried to force Johnson to accept him as his running mate. Johnson eliminated this threat by announcing that none of his cabinet members would be considered for second place on the Democratic ticket. Johnson also became concerned that Kennedy might use his scheduled speech at the 1964 Democratic Convention to create a groundswell of emotion among the delegates to make him Johnson's running mate; he prevented this by deliberately scheduling Kennedy's speech on the last day of the convention, after his running mate had already been chosen. Shortly after the 1964 Democratic Convention, Kennedy decided to leave Johnson's cabinet and run for the U.S. Senate in New York; he won the general election in November. 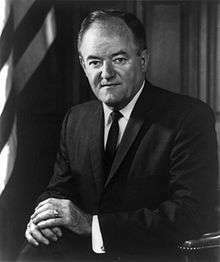 Johnson chose Senator Hubert Humphrey from Minnesota, a liberal and civil rights activist, as his running mate. Technically in South Dakota and Florida, Goldwater finished in second to "Unpledged Delegates," but he finished before all other candidates. The Republican Party (GOP) was badly divided in 1964 between its conservative and moderate-liberal factions. Former Vice-President Richard Nixon, who had been beaten by Kennedy in the extremely close 1960 presidential election, decided not to run. Nixon, a moderate with ties to both wings of the GOP, had been able to unite the factions in 1960; in his absence the way was clear for the two factions to engage in an all-out political civil war for the nomination. 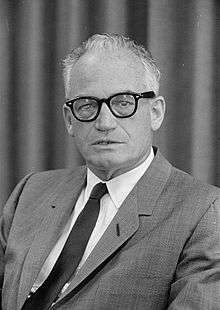 Barry Goldwater, a Senator from Arizona, was the champion of the conservatives. The conservatives had historically been based in the American Midwest, but beginning in the 1950s the conservatives had been gaining in power in the South and West. The conservatives favored a low-tax, small federal government which supported individual rights and business interests and opposed social welfare programs. The conservatives also resented the dominance of the GOP's moderate wing, which was based in the Northeastern United States. Since 1940, the Eastern moderates had successfully defeated conservative presidential candidates at the GOP's national conventions. The conservatives believed the Eastern moderates were little different from liberal Democrats in their philosophy and approach to government. 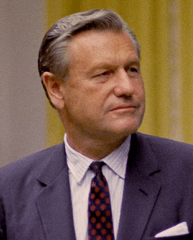 Goldwater's chief opponent for the Republican nomination was Nelson Rockefeller, the Governor of New York and the longtime leader of the GOP's liberal-moderate faction. Initially, Rockefeller was considered the front-runner, ahead of Goldwater. However, in 1963, two years after Rockefeller's divorce from his first wife, he married Margarita "Happy" Murphy, who was nearly 18 years younger than he and had just divorced her husband and surrendered her four children to his custody. 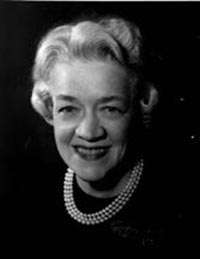 The fact that Murphy had suddenly divorced her husband before marrying Rockefeller led to rumors that Rockefeller had been having an extramarital affair with her. This angered many social conservatives and female voters within the GOP, many of whom called Rockefeller a "wife stealer". After his remarriage, Rockefeller's lead among Republicans lost 20 points overnight. Senator Prescott Bush of Connecticut, the father of President George H.W. Bush and grandfather of President George W. Bush, was among Rockefeller's critics on this issue: "Have we come to the point in our life as a nation where the governor of a great state—one who perhaps aspires to the nomination for president of the United States—can desert a good wife, mother of his grown children, divorce her, then persuade a young mother of four youngsters to abandon her husband and their four children and marry the governor?" In the first primary, in New Hampshire, both Rockefeller and Goldwater were considered to be the favorites, but the voters instead gave a surprising victory to the U.S. ambassador to South Vietnam, Henry Cabot Lodge Jr., Nixon's running mate in 1960 and a former Massachusetts senator. Lodge was a write-in candidate. He went on to win the Massachusetts and New Jersey primaries before withdrawing his candidacy because he had finally decided he didn't want the Republican nomination. Despite his defeat in New Hampshire, Goldwater pressed on, winning the Illinois, Texas, and Indiana primaries with little opposition, and Nebraska's primary after a stiff challenge from a draft-Nixon movement. Goldwater also won a number of state caucuses and gathered even more delegates. Meanwhile, Nelson Rockefeller won the West Virginia and Oregon primaries against Goldwater, and William Scranton won in his home state of Pennsylvania. Both Rockefeller and Scranton also won several state caucuses, mostly in the Northeast. The final showdown between Goldwater and Rockefeller was in the California primary. 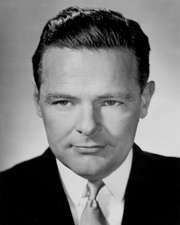 In spite of the previous accusations regarding his marriage, Rockefeller led Goldwater in most opinion polls in California, and he appeared headed for victory when his new wife gave birth to a son, Nelson Rockefeller Jr., three days before the primary. His son's birth brought the issue of adultery front and center, and Rockefeller suddenly lost ground in the polls. Goldwater won the primary by a narrow 51–49% margin, thus eliminating Rockefeller as a serious contender and all but clinching the nomination. With Rockefeller's elimination, the party's moderates and liberals turned to William Scranton, the Governor of Pennsylvania, in the hopes that he could stop Goldwater. However, as the Republican Convention began Goldwater was seen as the heavy favorite to win the nomination. The vice-presidential nomination went to little-known Republican Party Chairman William E. Miller, a Representative from upstate New York. Goldwater stated that he chose Miller simply because "he drives [President] Johnson nuts". In accepting his nomination, Goldwater uttered his most famous phrase (a quote from Cicero suggested by speechwriter Harry Jaffa): "I would remind you that extremism in the defense of liberty is no vice. And let me remind you also that moderation in the pursuit of justice is no virtue." For many GOP moderates, Goldwater's speech was seen as a deliberate insult, and many of these moderates would defect to the Democrats in the fall election. Although Goldwater had been successful in rallying conservatives, he was unable to broaden his base of support for the general election. Shortly before the Republican Convention, he had alienated moderate Republicans by his vote against the Civil Rights Act of 1964, which Johnson championed and signed into law. 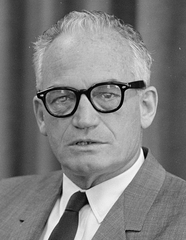 Goldwater said that he considered desegregation a states rights issue, rather than a national policy, and believed the 1964 act to be unconstitutional. Goldwater's vote against the legislation helped cause African-Americans to overwhelmingly support Johnson. Goldwater had previously voted in favor of the 1957 and 1960 Civil Rights acts, but only after proposing "restrictive amendments" to them. Goldwater was famous for speaking "off-the-cuff" at times, and many of his former statements were given wide publicity by the Democrats. In the early 1960s, Goldwater had called the Eisenhower administration "a dime store New Deal", and the former president never fully forgave him or offered him his full support in the election. In December 1961, he told a news conference that "sometimes I think this country would be better off if we could just saw off the Eastern Seaboard and let it float out to sea", a remark which indicated his dislike of the liberal economic and social policies that were often associated with that part of the nation. That comment came back to haunt him, in the form of a Johnson television commercial, as did remarks about making Social Security voluntary and selling the Tennessee Valley Authority. In his most famous verbal gaffe, Goldwater once joked that the U.S. military should "lob one [a nuclear bomb] into the men's room of the Kremlin" in the Soviet Union. Goldwater was also hurt by the reluctance of many prominent moderate Republicans to support him. Governors Nelson Rockefeller of New York and George Romney of Michigan refused to endorse Goldwater and did not campaign for him. On the other hand, former Vice-President Richard Nixon and Governor Scranton of Pennsylvania loyally supported the GOP ticket and campaigned for Goldwater, although Nixon did not entirely agree with Goldwater's political stances and said that it would "be a tragedy" if Goldwater's platform were not "challenged and repudiated" by the Republicans. The New York Herald-Tribune, a voice for eastern Republicans (and a target for Goldwater activists during the primaries), supported Johnson in the general election. Some moderates even formed a "Republicans for Johnson" organization, although most prominent GOP politicians avoided being associated with it. Shortly before the Republican convention, CBS reporter Daniel Schorr wrote from Germany that "It looks as though Senator Goldwater, if nominated, will be starting his campaign here in Bavaria, center of Germany's right wing" and "Hitler's stomping ground" and finding that Goldwater would be speaking to a gathering of "right-wing Germans" uniting the extremists in both countries. In fact, there was no such meeting nor trip planned. Fact magazine published an article polling psychiatrists around the country as to Goldwater's sanity. Some 1,189 psychiatrists appeared to agree that Goldwater was "emotionally unstable" and unfit for office, though none of the members had actually interviewed him. The article received heavy publicity and resulted in a change to the ethics guidelines of the American Psychiatric Association. In a libel suit, a federal court awarded Goldwater $1 in compensatory damages and $75,000 in punitive damages. Eisenhower's strong backing could have been an asset to the Goldwater campaign, but instead its absence was clearly noticed. When questioned about the presidential capabilities of the former president's younger brother, university administrator Milton S. Eisenhower, in July 1964, Goldwater replied, "One Eisenhower in a generation is enough." However, Eisenhower did not openly repudiate Goldwater and made one television commercial for Goldwater's campaign. A prominent Hollywood celebrity who vigorously supported Goldwater was Ronald Reagan. Reagan gave a well-received televised speech supporting Goldwater; it was so popular that Goldwater's advisors had it played on local television stations around the nation. Many historians consider this speech—"A Time for Choosing"—to mark the beginning of Reagan's transformation from an actor to a political leader. In 1966, Reagan would be elected Governor of California in a landslide. Johnson positioned himself as a moderate and succeeded in portraying Goldwater as an extremist. Goldwater had a habit of making blunt statements about war, nuclear weapons, and economics that could be turned against him. Most famously, the Johnson campaign broadcast a television commercial on September 7 dubbed the "Daisy Girl" ad, which featured a little girl picking petals from a daisy in a field, counting the petals, which then segues into a launch countdown and a nuclear explosion. The ads were in response to Goldwater's advocacy of "tactical" nuclear weapons use in Vietnam. "Confessions of a Republican", another Johnson ad, features a monologue from a man who tells us that he had previously voted for Eisenhower and Nixon, but now worries about the "men with strange ideas", "weird groups" and "the head of the Ku Klux Klan" who were supporting Goldwater; he concludes that "either they're not Republicans, or I'm not". Voters increasingly viewed Goldwater as a right-wing fringe candidate. His slogan "In your heart, you know he's right" was successfully parodied by the Johnson campaign into "In your guts, you know he's nuts", or "In your heart, you know he might" (as in "he might push the nuclear button"), or even "In your heart, he's too far right". Some cynics wore buttons saying "Even Johnson is better than Goldwater!" The Johnson campaign's greatest concern may have been voter complacency leading to low turnout in key states. To counter this, all of Johnson's broadcast ads concluded with the line: "Vote for President Johnson on November 3. The stakes are too high for you to stay home." 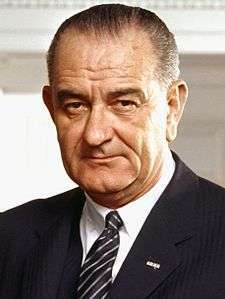 The Democratic campaign used two other slogans, "All the way with LBJ" and "LBJ for the USA". The election campaign was disrupted for a week by the death of former president Herbert Hoover on October 20, 1964, because it was considered disrespectful to be campaigning during a time of mourning. Hoover died of natural causes. He had been U.S. president from 1929 to 1933. Both major candidates attended his funeral. Johnson led in all opinion polls by huge margins throughout the entire campaign. The election was held on November 3, 1964. Johnson beat Goldwater in the general election, winning over 61% of the popular vote, the highest percentage since the popular vote first became widespread in 1824. In the end, Goldwater won only his native state of Arizona and five Deep South states—Louisiana, Mississippi, Georgia, Alabama and South Carolina—that had been increasingly alienated by Democratic civil rights policies. This was the best showing in the South for a GOP candidate since Reconstruction. The five Southern states that voted for Goldwater swung over dramatically to support him. For instance, in Mississippi, where Democrat Franklin D. Roosevelt had won 98% of the popular vote in 1936, Goldwater won 87% of the vote. Of these states, Louisiana had been the only state where a Republican had won even once since Reconstruction. Mississippi, Alabama and South Carolina had not voted Republican in any presidential election since Reconstruction, and Georgia had never voted Republican even during Reconstruction (thus making Goldwater the first Republican to ever carry Georgia). The 1964 election was a major transition point for the South, and an important step in the process by which the Democrats' former "Solid South" became a Republican bastion. Nonetheless, Johnson still managed to eke out a bare popular majority of 51–49% (6.307 to 5.993 million) in the eleven former Confederate states. Conversely, Johnson was the first Democrat ever to carry the state of Vermont in a Presidential election, and only the second Democrat to carry Maine in the 20th century. Maine and Vermont had been the only states that FDR had failed to carry during any of his four successful presidential bids. Of the 3,126 counties/districts/independent cities making returns, Johnson won in 2,294 (73.38%) while Goldwater carried 826 (26.42%). Unpledged Electors carried six counties in Alabama (0.19%). The Johnson landslide defeated many conservative Republican congressmen, giving him a majority that could overcome the conservative coalition. This is the first election to have participation of the District of Columbia under the 23rd Amendment to the US Constitution. The Johnson campaign broke two American election records previously held by Franklin Roosevelt: the most number of Electoral College votes won by a major-party candidate running for the White House for the first time (with 486 to the 472 won by Roosevelt in 1932) and the largest share of the popular vote under the current Democratic/Republican competition (Roosevelt won 60.8% nationwide, Johnson 61.1%). This first-time electoral count was exceeded when Ronald Reagan won 489 votes in 1980. Johnson retains the highest percentage of the popular vote as of the 2012 election. Source (Popular Vote): Leip, David. "1964 Presidential Election Results". Dave Leip's Atlas of U.S. Presidential Elections. Retrieved May 8, 2013. Presidential election results by county. Democratic presidential election results by county. Republican presidential election results by county. Unpledged Electors presidential election results by county. 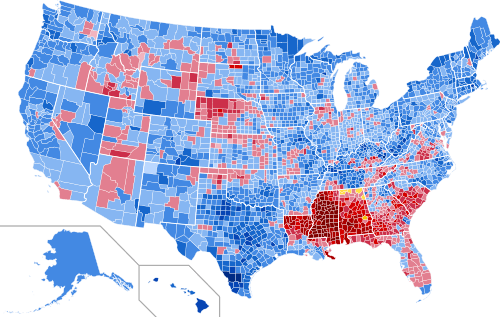 "Other" presidential election results by county. Cartogram of presidential election results by county. Cartogram of Democratic presidential election results by county. Cartogram of Republican presidential election results by county. Cartogram of Unpledged Electors presidential election results by county. Cartogram of "Other" presidential election results by county. Although Goldwater was decisively defeated, some political pundits and historians believe he laid the foundation for the conservative revolution to follow. Ronald Reagan's speech on Goldwater's behalf, grassroots organization, and the conservative takeover (although temporary in the 1960s) of the Republican party would all help to bring about the "Reagan Revolution" of the 1980s. Indeed, many of today's leading politicians first entered politics to work for Goldwater, including Hillary Clinton. Johnson went from his victory in the 1964 election to launch the Great Society program at home, signing the Voting Rights Act of 1965 and starting the War on Poverty. He also escalated the Vietnam War, which eroded his popularity. 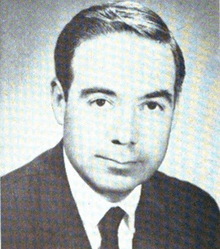 By 1968, Johnson's popularity had declined and the Democrats became so split over his candidacy that he withdrew as a candidate. Moreover, his support of civil rights for African Americans helped split white union members and Southerners away from Franklin Roosevelt's Democratic New Deal Coalition, which would later lead to the phenomenon of the "Reagan Democrat". Of the twelve presidential elections that followed up to 2012, Democrats would win only five times. The election also furthered the shift of the African-American voting electorate away from the Republican Party, a phenomenon which had begun with the New Deal. Since the 1964 election, Democratic presidential candidates have almost consistently won at least 80-90% of the African-American vote in each presidential election. 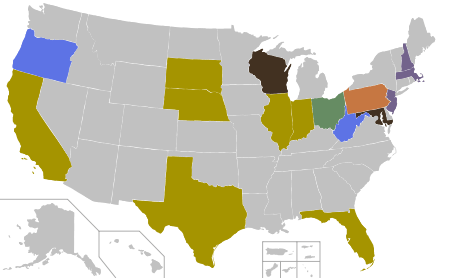 This was the first time in United States history that the state of Vermont voted for the Democratic candidate, and the first time that Georgia voted for the Republican candidate. This was the first election in which the District of Columbia received voters in the Electoral College. To date, the District has not once voted Republican in any of the presidential elections in which it has been allotted presidential electors. The 1964 election was the last time to date that any of the following states voted for a Democrat: Alaska, Idaho, Kansas, Nebraska, North Dakota, Oklahoma, South Dakota, Utah and Wyoming. Virginia and Indiana were among these until President Barack Obama won them in the 2008 election in which he also won one electoral vote from Nebraska's second congressional district. It is also the only time in Alaska's history that the state has voted for a Democratic presidential candidate. This would be the last time to date that a Democrat would win a double-digit margin in the popular vote and over four-fifths of the electoral vote. Republicans have won such margins in two elections since: 1972 and 1984. 1964 was the last time that a Democratic presidential candidate received a majority (or plurality) of white voters. This was the first time that a Democratic presidential candidate carried every Northeastern state. Not only did Johnson carry the electoral votes of every Northeastern state, but he also won all of them with over 60% of the popular vote. While the 1964 election effectively marked the beginning of Republican dominance in the South, it also started to mark dominance of the Democrats in the Northeast. The election of 1964 was the first time since 1912 that Maine cast its electoral votes for a Democratic presidential candidate, and the first time since 1852 that Maine gave a Democratic presidential candidate an absolute majority of the popular vote (The Democrats narrowly won Maine in 1912 with a 39% plurality). This was the third and last time that the victorious candidate wasn't on the ballot in all of the states. Alabama had refused to let Johnson on the ballot in this election and Truman in 1948. In 1860, Lincoln did not appear on the ballot in 10 states. It was the first time that there were 538 electoral votes and the number has remained that ever since. 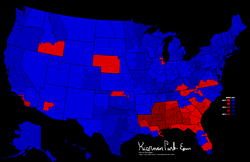 The 1960 election had as many states but 537 electoral votes. ↑ Although the 1960 election had been the first in which all fifty states voted, two states (Mississippi and Alabama) voted for unpledged electors that refused to vote for either of the major party nominees, and were therefore reckoned not to have been carried by any presidential candidate. 1 2 Weaver Jr., Warren (November 23, 1963). "Parties' Outlook for '64 Confused". The New York Times. p. 1. ↑ Bigart, Homer (November 26, 1963). "GOP Leaders Ask Halt in Campaign". New York Times. p. 11. ↑ Unger and Unger; LBJ; a Life (1999) pp. 325-6; Dallek Flawed Giant, p. 164; Evans and Novak (1966) 451-56 claim that the MFDP fell under the influence of "black radicals" and rejected their seats. 1 2 3 4 5 6 Frum, David (2000). How We Got Here: The '70s. New York: Basic Books. pp. 58–59. ISBN 0-465-04195-7. 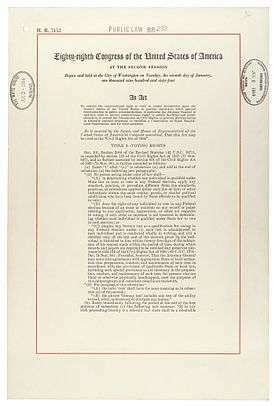 ↑ "Civil Rights Act of 1964 – CRA – Title VII – Equal Employment Opportunities – 42 US Code Chapter 21". Archived from the original on November 14, 2009. 1 2 Barnes, Bart (May 30, 1998). "Barry Goldwater, GOP Hero, Dies". The Washington Post. Retrieved November 6, 2016. 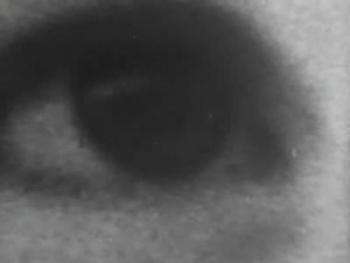 ↑ "The Living Room Candidate – Commercials – 1964 – Eastern Seabord". ↑ "The Living Room Candidate – Commercials – 1964 – Social Security". ↑ Black, Conrad (2007), p. 464. ↑ Will, George (October 3, 2010). "With their hands tied, Democrats pound the table". Atlanta Journal-Constitution. p. A23. ↑ Nick Gillespie (July 30, 2006). "The Hard Right". New York Times. ↑ Sally Satel (June 30, 2004). "Essay; The Perils of Putting National Leaders on the Couch". New York Times. ↑ "' 64 Poll of Psychiatrists On Goldwater Defended". September 5, 1965. ↑ "EXPERT CONDEMNS GOLDWATER POLL – Tells Libel Trial Magazine Survey Was 'Loaded' – Article – NYTimes.com". May 16, 1968. ↑ "Goldwater Awarded $75,000 in Damages In His Suit for Libel – Goldwater Wins $75,000 in Libel Action – Front Page – NYTimes.com". May 25, 1968. ↑ Archived March 16, 2008, at the Wayback Machine. ↑ "The Living Room Candidate – Commercials – 1964 – Peace Little Girl (Daisy)". ↑ "The Living Room Candidate – Commercials – 1964 – Confessions of a Republican". ↑ "Gallup Presidential Election Trial-Heat Trends, 1936-2008". gallup.com. Gallup, Inc. Retrieved 30 August 2012. ↑ "1964 Presidential General Election Data – National". Retrieved March 18, 2013. ↑ "Dave Leip's Atlas of U.S. Presidential Elections – Compare Data". ↑ "Exit Polls – Election Results 2008 – The New York Times". 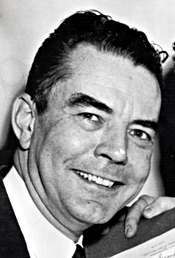 George H. Gallup, ed. (1972). The Gallup Poll: Public Opinion, 1935–1971. 3 vols. Random House. Steve Fraser; Gary Gerstle, eds. (1990). The Rise and Fall of the New Deal Order, 1930–1980. Arthur Meier Schlesinger Jr., ed. (2001). History of American Presidential Elections, 1789–2000. Barone, Michael; Grant Ujifusa (1967). The Almanac of American Politics 1966: The Senators, the Representatives and the Governors: Their Records and Election Results, Their States and Districts. Brennan, Mary C. (1995). Turning Right in the Sixties: The Conservative Capture of the G. O. P. University of North Carolina Press. Burdick, Eugene (1964). The 480. – a political fiction novel around the Republican campaign. Dallek, Robert (2004). Lyndon B. Johnson: Portrait of a President. Donaldson, Gary (2003). Liberalism's Last Hurrah: The Presidential Campaign of 1964. M. E. Sharpe. ISBN 0-7656-1119-8. Goldberg, Robert Alan (1995). Barry Goldwater. Hamby, Alonzo (1992). Liberalism and Its Challengers: From F.D.R. to Bush. Hodgson, Godfrey (1996). The World Turned Right Side Up: A History of the Conservative Ascendancy in America. Houghton Mifflin Company. Jensen, Richard (1983). Grass Roots Politics: Parties, Issues, and Voters, 1854–1983. Kolkey, Jonathan Martin (1983). The New Right, 1960–1968: With Epilogue, 1969–1980. Ladd, Everett Carll Jr.; Charles D. Hadley (1978). Transformations of the American Party System: Political Coalitions from the New Deal to the 1970s. 2nd ed. Lesher, Stephan (1995). George Wallace. Matthews, Jeffrey J. (1997). "To Defeat a Maverick: The Goldwater Candidacy Revisited, 1963–1964". Presidential Studies Quarterly. 27 (4): 662+. McGirr, Lisa (2002). Suburban Warriors: The Origins of the New American Right. Perlstein, Rick (2002). Before the Storm: Barry Goldwater and the Unmaking of the American Consensus. Rae, Nicol C. (1994). Southern Democrats. Oxford University Press. Sundquist, James L. (1983). Dynamics of the Party System: Alignment and Realignment of Political Parties in the United States. White, Theodore (1965). The Making of the President: 1964.